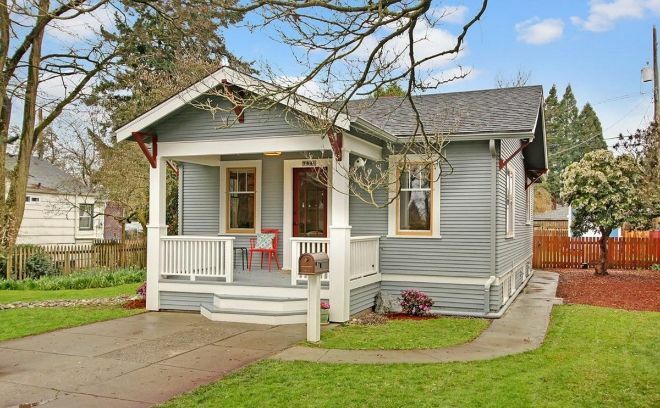 This cute 1925 Craftsman looks like it's ages away from a major metropolitan area, but it couldn't be more well-connected. Just 7 miles out of downtown Seattle, it'll take less than 15 minutes to get over to the famed Pike Place Market by car. While the home is near some happening spots, it's far enough away that being home means escaping the hustle and bustle of the metropolis. If you had to sum up this home with one word, it'd be deceitful. 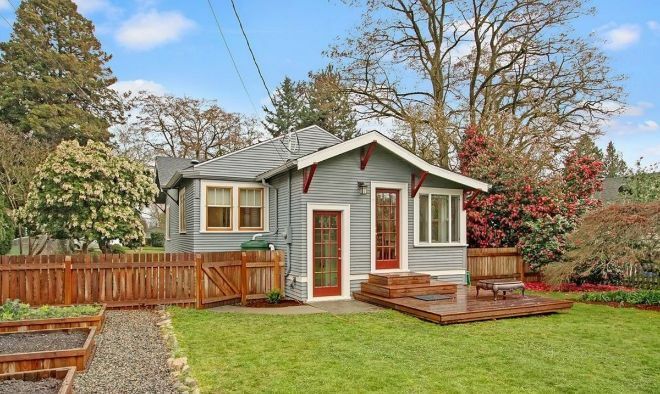 While it's certainly charming from the outside, you might think that this is a small home if you judged it by its facade. A dive inside reveals a home more spacious than you'd assume. 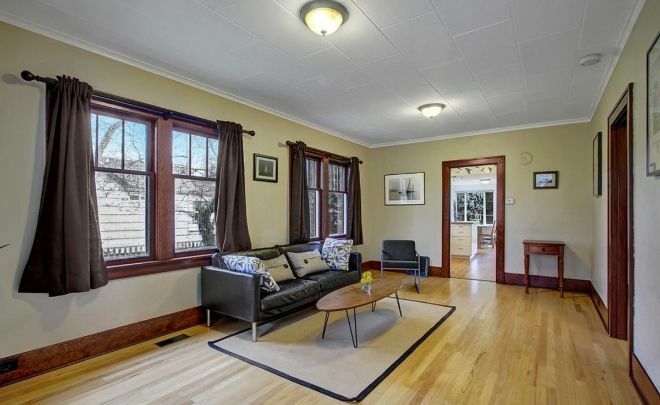 This living room uses dark baseboards as accents to the light, hardwood floor. A midcentury table is highlighted at the center of it all, in front of a modern, black leather couch. 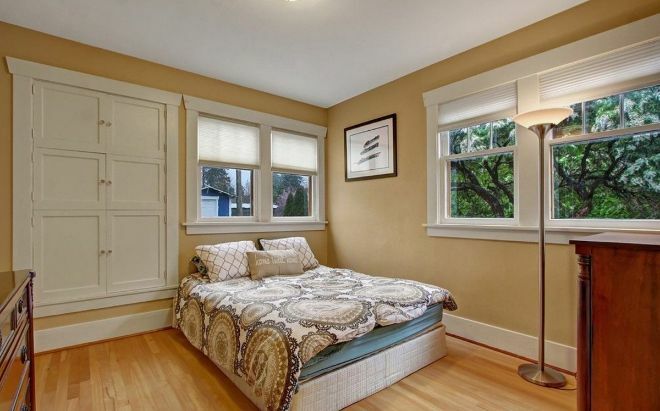 One of the two smaller bedrooms in this home is spacious, too. 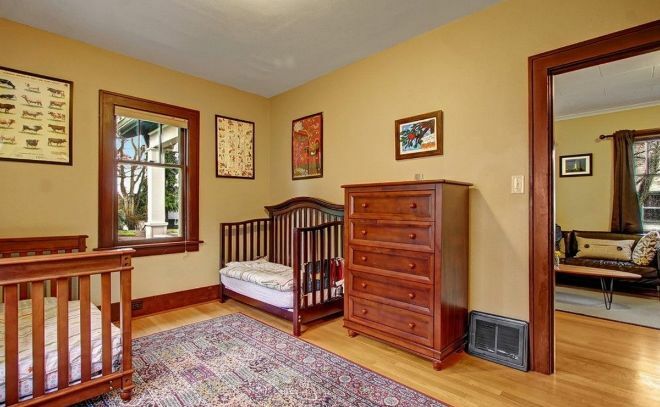 Clearly there's enough space here for a couple of toddlers to share the room. This room looks out on the front lawn — the window visible in this room seems to be the rightmost window in the picture above. The second main-floor bedroom has windows stretching across two walls, only to be interrupted on one wall by a characteristic set of cabinets built into the establishment. 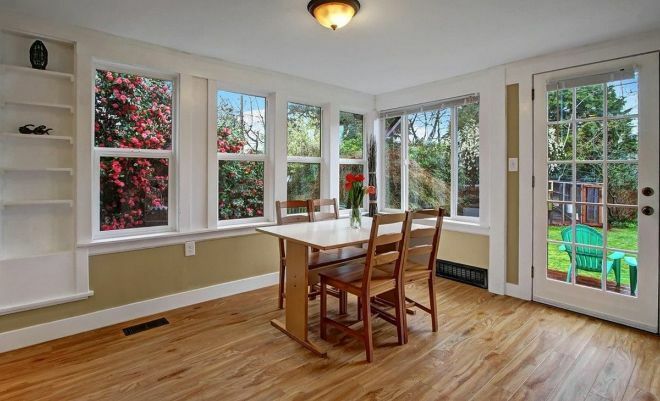 The natural wood finish found across the baseboard, window sills, and door frames of the previous rooms have been replaced here with a white paint. This theme continues through the kitchen. Much of this unit's 1,800 square feet are on display throughout its kitchen and dining room, which sport an open feeling. A waist-high island is all that separates the kitchen from the dining room, which gives this space an airy touch. On a sunny afternoon, it's safe to assume that this space is flooded with sunlight. Considering that the house faces east, it's likely that the warm tones of the Pacific sunset cover every crevice of this room on clear evenings. 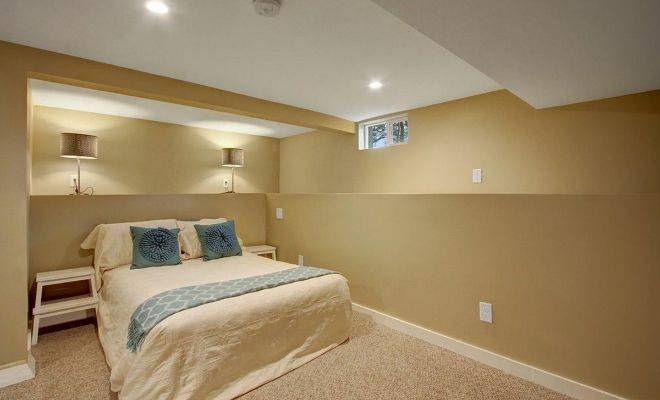 This lower-level bedroom has room for all the essentials — and not much more. That's alright, though, considering that science tells us we should only be using our nighttime spaces for nighttime activities if we're aiming for a great night's rest. 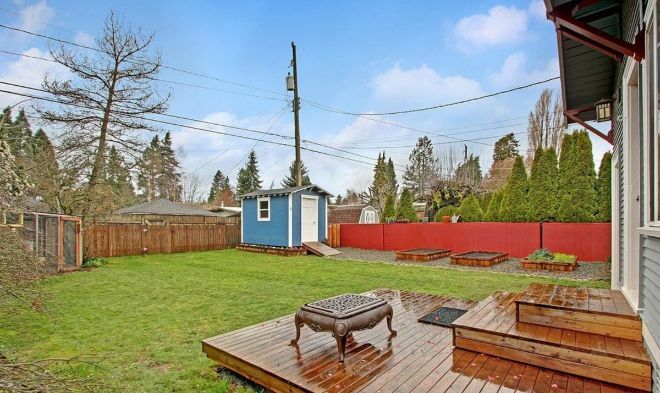 This backyard is ideal for that summer bash you've been dreaming of for years. It's got a fence to keep your neighbor's eyes out, and to keep your young kids in! 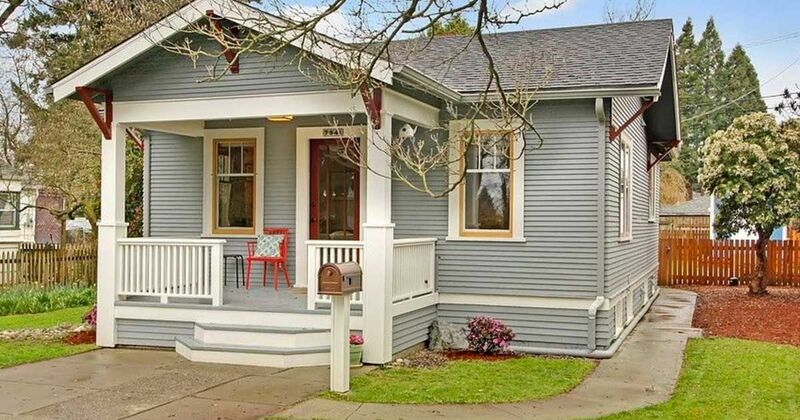 The view from the backyard reveals a small porch, perfect for spending summer evenings. Did you dig this home? Be sure to let us know what you thought in the comments, and when you're done, share it with your friends on Facebook. They might like it even more than you did! 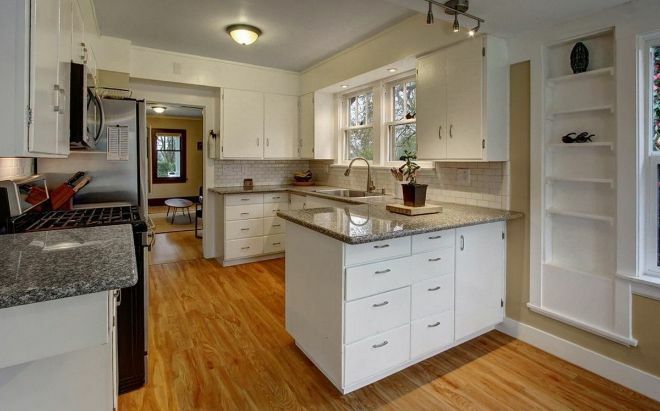 Measuring 4,950 square feet, this gorgeous Craftsman home is located in Palo Alto. Built by FGY Architects, the home has plenty of gorgeous features, including tapered columns around the front of the home and plenty of large, partially paned windows.